A bomb attack on a Revolutionary Guards bus in Iran's Sistan and Baluchestan Province Wednesday killed some 40 people. 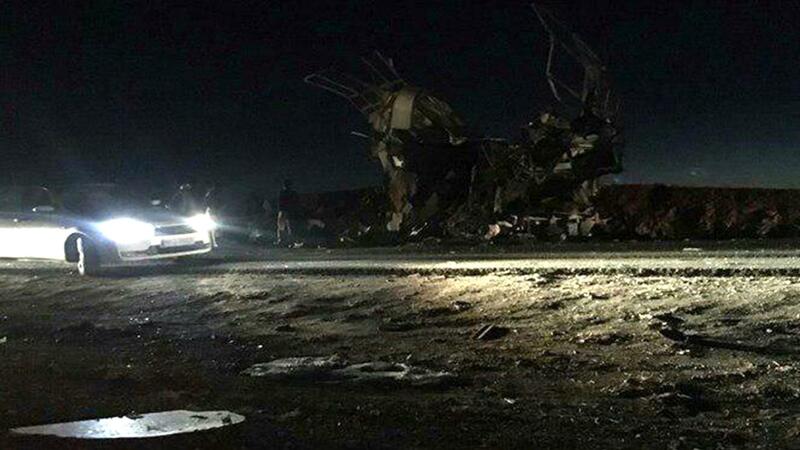 A truck bomb attack on a bus carrying members of Iran's Islamic Revolutionary Guard Corps, killed 27 Guards and wounded 13 others in the southeastern Sistan and Baluchistan Province on Wednesday, according to Iranian media reports. The Guards, part of the elite branch of Iran's armed forces, were traveling a 100-mile mountainous route from the city of Khash to the provincial capital of Zahedan, when they came under attack, reports Iran's semi-official Fars news agency, citing a statement from the Revolutionary Guards. The group's Quds Force unit said the United States, its allies and Zionism shared responsibility for the attack, without elaborating on the claim. But the Terrorism Research & Analysis Consortium, known as TRAC, posted a tweet allegedly showing a message from the Sunni militant group Jaish al Adl, claiming responsibility for the attack. The group's fighters, whose name is also spelled Jaysh al Adl, which translates to Army of Justice, have been known to stage attacks in the greater Baluchistan area targeting Shia Muslims. The region, which borders Afghanistan and Pakistan, is occasionally marred by Baluch separatist attacks, reports NPR's Peter Kenyon. In December, another deadly suicide bombing targeted police in the city of Chabahar. Wednesday's attack came as a two-day international summit kicked off in Poland. The U.S. is co-hosting the gathering called the Ministerial to Promote a Future of Peace and Security in the Middle East. But the focus is expected to be on Iran and what Secretary of State Mike Pompeo has referred to as countering its "malign influence." In a tweet, Iranian Foreign Affairs Minister Javad Zarif, who has been critical of the Warsaw gathering, obliquely implied there could be a connection between the summit and the attack on the Revolutionary Guards. Is it no coincidence that Iran is hit by terror on the very day that #WarsawCircus begins? Especially when cohorts of same terrorists cheer it from Warsaw streets & support it with twitter bots? US seems to always make the same wrong choices, but expect different results. The attack came on the heels of Iran's celebrating the 40th anniversary of its revolution, which saw the overthrow of the U.S.-backed shah as well as the founding of the Revolutionary Guard Corps, which is tasked with preserving the Islamic Republic.